Proof #1: Was yesterday April Fools’ Day? No. Was the day before yesterday April Fools’ Day? No. Hence, by induction, we may conclude that today is not April Fools’ Day. Proof #2: April Fools’ Day only happens once a year. So, the probability that today is April Fools’ day is 1/365. That’s almost 0. Proof #3: If today were April Fools’ day, there would be unanimous consensus about the fact, but there isn’t, because I disagree. I feel like I see a lot of pro-donut signs (America Runs On Dunkin’, etc.) so an ostensibly anti-donut sign is a bit of fresh air. I have a taste for nonsensical and ludicrous signage, from Engrish to Legalese, and here, opportunity called. I’m interested in graphic leitmotifs like the red circle with a slash through it. Red circles with slashes mean business. Usually there’s a more complicated icon inside the circle that represents the thing to be avoided or “not done.” But in this case, the inner icon is as simple as possible: a donut that matches the red circle’s contour. Perhaps the red circle was built to fit (glaze?) that donut in an act of accommodation? In this sign the “thing” and the “thing that negates it” are pals, in perfect formal agreement. 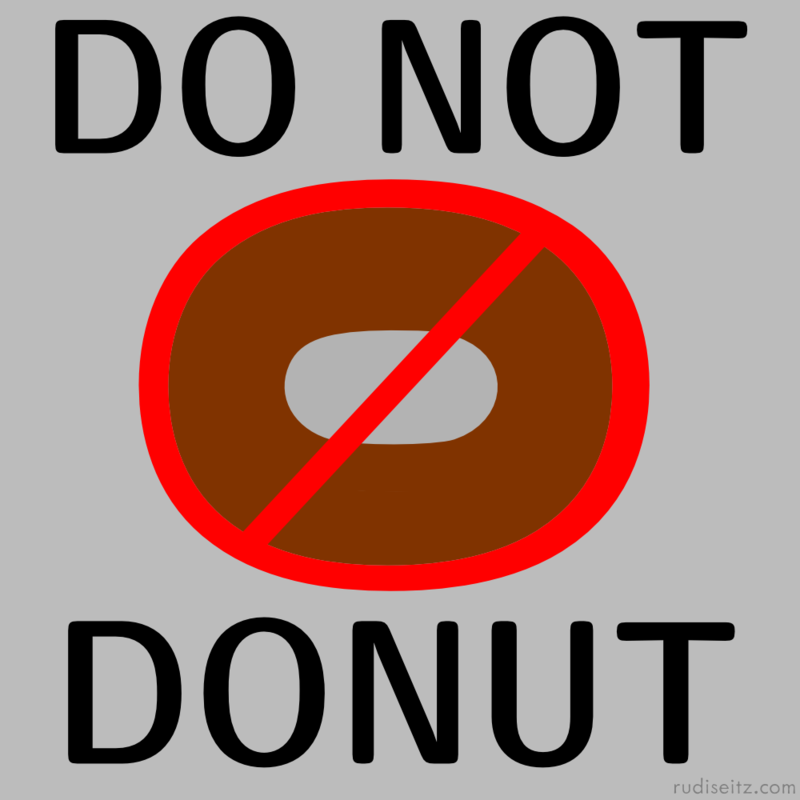 Lastly, the phrase “Do not donut” has caused me to develop a huge number of tongue-twisters that I really should stop saying, so “Do not donut!” means to me “Stop saying tongue-twisters about donuts!” Unfortunately, the sign doesn’t help! The donut and enclosing circle in this sign were constructed from various sizes of the “O” from the font used in the lettering. See also: DO NOT DUPLICATE. 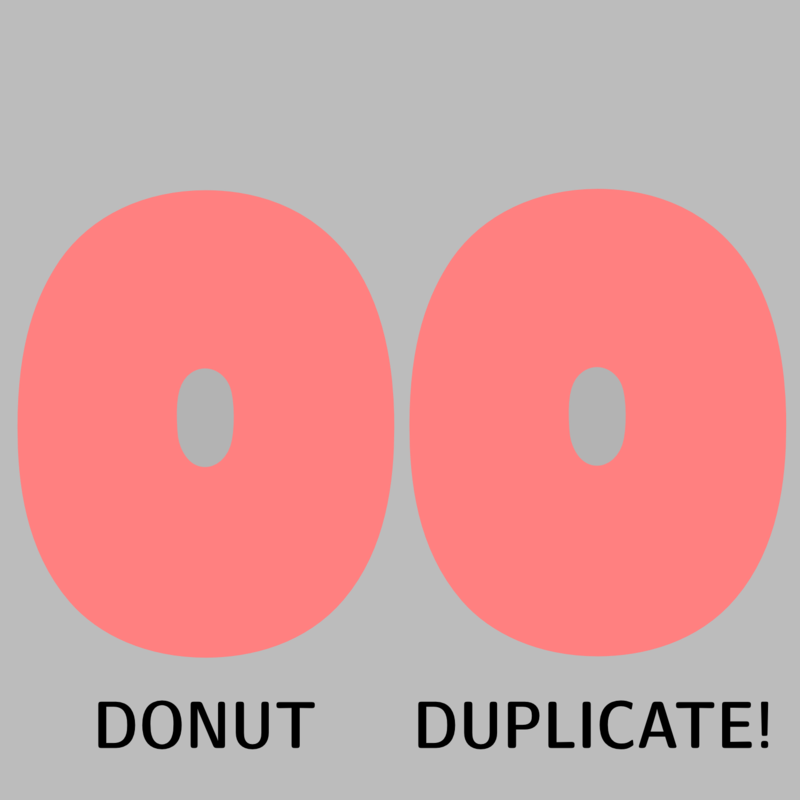 DO NOT DUPLICATE DONUT DUPLICATES!